Fussy and Fancy Friday Challenge: Winners of Our Christmas in July Challenge! Winners of Our Christmas in July Challenge! It's time for the winners of our Christmas in July Challenge! We had so many wonderful entries--you folks have gotten a great head start on your Christmas cards! One winner will receive 7 digis from Bugaboo Stamps . Be sure to check out their Christmas In July release here. Another winner will receive a stampset of choice from Inspired Stamps. And our top 5 today are. . .
Congratulations to everyone! Random winners, email Juanita for information on your prize. Top 5 winners, grab our blinkie and display it proudly! Thanks to all for entering and we look forward to seeing you again soon! Beautiful projects everyone. 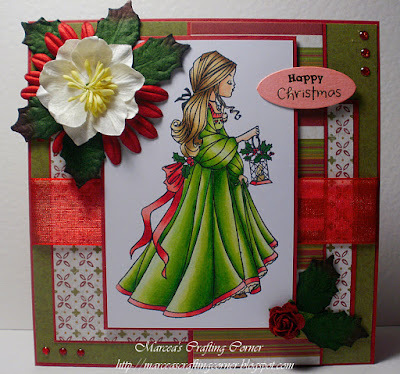 Love the coloring in that last card by Marcea. Well done. Tank you so much fro choosing me top 5. Thanks so much for choosing my card for the Top 5.